Did you know that you can order your own lab tests and blood tests online? Direct access testing lets you participate in your own healthcare! A visit to the doctor’s office is not necessary to obtain your own lab tests, including comprehensive blood work, hormone tests, thyroid, stool kits, toxic metals and more! It’s convenient, affordable, saves you time, and you’ll get a thorough and complete lab panel for hundreds of dollars less!!! Serious medical conditions can go undetected for up to two years without noticeable symptoms. A thorough and complete blood chemistry wellness test provides the best warning indicator. The earlier a problem is detected, the easier and more likely it is to be treatable. You now have direct access to major clinical laboratory testing across the U.S. for those important blood chemistry and wellness tests. Many consumers are under-insured, have high deductibles or health plans without a wellness benefit. Others get incomplete and insufficient lab testing from their primary doctor that is not comprehensive and missing many basic and important lab values. There are various online options. One of them being, Direct Labs, the leader in direct access laboratory testing. They offer a wide variety of important health and wellness blood chemistry tests directly to you online at extremely discounted prices. Their tests often cost less than they would through your provider, even with insurance. They offer lab testing for peak health and wellness, diabetes, heart disease, thyroid, hormones, heavy metal toxicity, gastrointestinal disorders, hidden and silent infections (bacterial, fungal, viral, SIBO, parasites, Candida overgrowth), brain health so much more. Below you’ll find the name of the blood tests, along with step-by-step instructions to order your own blood tests and lab tests online. 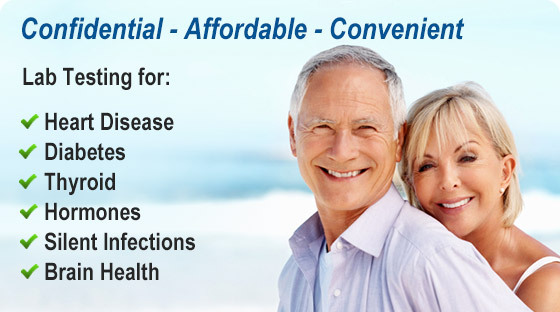 You can also order lab tests online from Direct Labs or My Labs for Life. After placing your order, you’ll print your lab requisition. On the Direct Labs’ website you will find a list of lab locations in your zip code area. Just plug your zip code into the search area on their site, and you’ll find a list of labs in your area in which you will take your lab requisition in for your fasted blood draw. Walk-in or schedule an appointment at the local lab test center of your choice. Take your printed lab order with you the day of your blood draw. Blood is drawn and then the results are emailed and uploaded to your account, which you can forward to my office for your Blood Chemistry Analysis. You will pay upfront out-of-pocket when ordering these tests from Direct Labs, however you can submit to your insurance company for possible reimbursement afterwards. Be sure to fast for 10-12 hours prior to the blood draw. No food or beverages other than water. Drink plenty of water the day before and morning of the blood draw. If you take thyroid medication, take it after the blood draw. Submit a copy of your lab results to my office for the Functional Blood Chemistry Analysis. If you’re a new client, completion of the Client Questionnaire is required for the new client package (the Ultimate Lifestyle Plan). The Blood Chemistry Analysis is included in the new client package, the Ultimate Lifestyle Plan. ★ Stool testing is one test I highly recommended, especially those experiencing digestive problems, bloating, gas, body odor, constipation, diarrhea, depression (95% of serotonin is produced in the gut – not the brain), leaky gut, gallbladder issues, immune dysfunction (70-80% of the immune system is in the gut), autoimmune disorders, Parkinson’s disease, and more. A comprehensive DNA stool test is an advanced stool test that is much more sensitive than the conventional stool test because it uses Polymerase Chain Reaction (PCR) technology to amplify the DNA measuring premier biomarkers of GI function, providing valuable insight into digestive performance, gut inflammation, and the gut microbiome — areas affecting not only GI health, but overall health as well. A comprehensive DNA stool analysis provides an extensive look at GI function. This test evaluates microbiota, levels of healthy gut flora (bacteria balance and imbalances), detects underlying pathogens, dysbiotic bacteria, parasites, Candida, yeast, fungal and bacterial infections, maldigestion and malabsorption, inflammation, immune function (sIgA), short chain fatty acid status and other biomarkers of GI health. A purged stool test currently provides the most sensitive diagnostic method for evaluating the presence and levels of parasites. However, parasites do NOT always show up, even on the best of stool and other testing methods unless one has an acute parasite infection. Therefore, it’s crucial to factor in an individual’s unique biochemistry, their health history, their health timeline, subjective indicators, symptoms, and health conditions. Stop all vitamins and supplements that affect digestion for two full weeks prior to collecting your stool samples. You may resume vitamins after submitting your stool samples. Submit at copy of your stool test results to my office for the analysis and review of your results. Test to Assess, Don’t Guess! You can also bring this list of lab tests in to your doctor. Download the list of labs here. Normal does not mean optimal or healthy! Have you been told “your blood test results and your lab tests results are completely normal and everything looks great,” yet you know that something is off and you’re still not feeling your best? “Normal” lab reference ranges of standard labs are designed to identify diseased states only, whereas “optimal” lab reference ranges are used to assess potential risk for disease before the disease develops, underlying imbalances, nutrient deficiencies or excesses, hormone imbalances, plus so much more. True health is defined as being free of pain and disease, having energy, healthy digestion, balanced hormones, sleeping well, being happy and fulfilled, and thinking, feeling and looking your best! A functional blood chemistry analysis and the right lab tests is one of the best methods of self-care. Even if you eat right, exercise and eliminate bad habits, you may have an underlying medical condition, nutritional deficiencies, or hormone imbalances that only a functional blood chemistry analysis can detect. Questions about blood tests, stool testing or other lab tests??? Contact my office! Be Empowered! Take charge of your health today. Identify the Root Cause. Test to Assess, Don’t Guess!